Play only if the Runner has at least 2 tags. I hate this card. Not because it's bad. No: just because it's so nasty that you can't build a runner deck without playing around this. First of all: good ways to play this card. NBN has Breaking News which fits perfectly to this card. If you can score it with your first click, having BOOM! in your hand, this could be a game breaker. But more elegant is the combination with 24/7 News Cycle to resolve the news again. Midseason Replacements is of course another good combination as well. You only have to spend enough credits to give him 2 tags. Big Brother also deserved a honorable mention. If you tagged the runner on last click with for example Prisec you can increase the number of tags to two to play your BOOM! The best way to tag the runner is Hard-Hitting News if he runs out of money. But if you do that, the runner has a complete turn to prevent your BOOM! The most amazing combo is in Weyland. This works best in a horizontal deck like Gagarin Deep Space: Expanding the Horizon. You only need to place a Mumbad City Hall in a server having both BOOM! and Consulting Visit in R&D. Museum of History helps you to get both in it, if you need it there. The museum can be tutored with the city hall as well and hard hitting news can be tutored with consulting visit. If you have everything out there spam him with tags until he runs out of money and then play one BOOM! every turn. How to prevent being killed by BOOM as a runner? First strategy: don't get tagged. Use New Angeles City Hall Decoy and Forger to avoid the second tag. Or don't run if you have less than 8 credits (or 4 if you use Networking ), don't steal an agenda if the corp has more money. And never run on your last click. That is hard and annoying, so I don't think that this is the way to handle this. Third strategy: prevent meat damage. 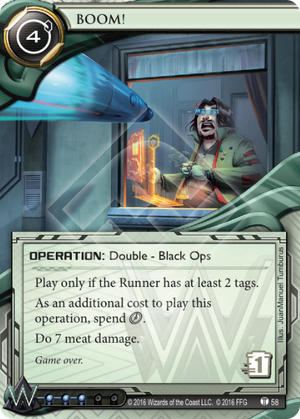 Play Citadel Sanctuary Crash Space Sacrificial Clone Paparazzi or Guru Davinder but you should know that the corp can trash these cards. They will give you one more turn until the corp can fulfill their master plan. I've Had Worse or Muresh Bodysuit doesn't help because you will get all 7 meat damage once. But there are still Plascrete Carapace which can save you up to two times. If you draw an play it in time. And only until it cycles out. Fourth strategy: trash BOOM! This is the best part of the card: if you access it, you can trash it for only 1 credit. Get multi access to R&D and HQ with The Maker's Eye / Legwork, R&D Interface / HQ Interface or Nerve Agent / Medium and access it before the corp can play it. But be aware of Archived Memories or Clone Suffrage Movement. Add Salsette Slums or Archives Interface to remove the card from the game.